Sometimes you get to work with clients that have a little extra special meaning. And for Charlie Howlett, TCU Baseball is one of those. Back in 2003, he was a fresh-faced frosh on the Horned Frog baseball team under Coach Lance Brown. Don’t be mistaken; Charlie is way tougher than he looks. As a catcher, he spent plenty of time sweltering behind the plate. 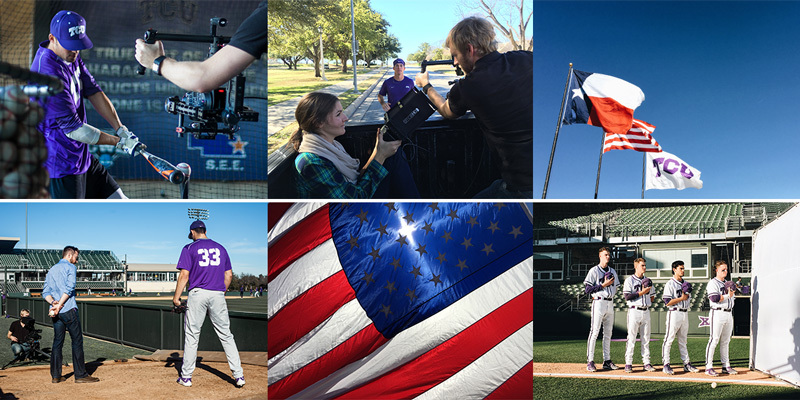 Given his love of baseball and his passion for the Horned Frog baseball program the chance to work on the team video was a perfect fit. For the past three years, Coach Schlossnagle has asked the Schaefer team to create a video that captures his coaching theme for that year. This year, the focus is on choices we make that separate people into two categories: Common and Uncommon. Based on the principles of Selfless – Energy – Excellence, it’s the small choices made every day that begin to turn common boys into uncommon men. Every swing, every pitch, every catch – the TCU baseball program focuses on developing the complete student athlete – giving players every advantage possible to realize their full potential. In this year’s video, we step into the minds of the 2016 Horned Frogs at that moment right before game time. They are replaying the culmination of big and small choices, mixed with coaching and individual preparation that will ultimately lead this team into the new season. See some behind the scenes photos on our Facebook page.